An integral part of the Expo each year are the Q&A sessions. Even after nine years, the Festival of Fear still manages to snag wonderful guests to appear during its four day stretch. 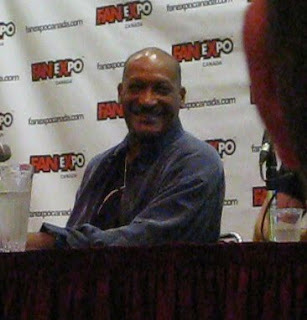 On the Thursday, returning after his last visit in 2006, was character actor and The Candyman himself, Tony Todd. Todd is an extremely affable, humble and soft-spoken man who loves his craft. Obviously, the focus was on his most notable role, that of the title character in 1992’s Candyman, but he also spoke of his entire career, which began with Oliver Stone's 1986 war film Platoon. Someone asked what it was like to work on The X-Files. He also talked at length about his experience shooting the “The Visitor” episode of Star Trek: Deep Space Nine. It was around the time Todd lost his mother and channelled that into his performance, which involves him playing an adult version of Cirroc Lofton's Jake Sisto character. When asked which role has been his favourite – next to Candyman of course – he pointed to his recent turn as sinister crime boss Duke in the flick Sushi Girl. Having seen this film last month at Fantasia, I can agree that he is great in it; one of a strong ensemble that includes James Duval, Andy Mackenzie & Mark Hamill. Then, the question of an inevitable Candyman remake was brought up, and who Todd would like to see fill the role. He could barely answer the question, as he knows as well as anyone that no one could wield that bloody hook as well as he did. Shortly after that though, someone asked with that disdainful attitude toward remakes, was he at all apprehensive about starring in the Night of the Living Dead remake in 1990? I don’t know which is sadder. That bit above, or the fact it doesn’t surprise me. With AMC’s The Walking Dead breaking through into the mainstream this year, it seemed the biggest draw of the weekend was the appearance of two cast members from the show. Jon Bernthal & Norman Reedus – who play Shane & Darryl respectively – were on hand to speak to the thralls of fans who turned up on Saturday. Bernthal entertained the crowd, as he waited for his cohort to “powder his nose”. Then, Reedus finally appeared from the back of the hall and ran up the aisle, slapping hands as he went. 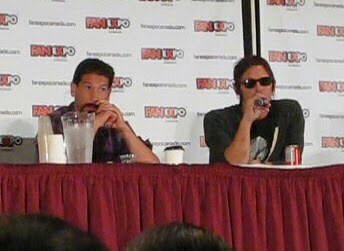 Jon Bernthal (left) & Norman Reedus. Over the course of the Q&A, you could tell they were enjoying the hell out of the success of the show and felt blessed to be part of it. It was interesting hearing about the differences between how they approached their roles, as Bernthal knew going in that his time was limited, whereas Reedus – whose character is not in the comic – had a clean slate to work with. Reedus was asked about how his Darryl's brother Merle's (played by Michael Rooker) reappearance will affect his character. He also spoke of his young co-star Chandler Riggs (who plays Carl) and that he's been very impressed with his acting ability this season and he's enjoying seeing his fascinating story arc unfold. They then quickly talked about their upcoming projects. Bernthal is starring in Frank Darabont's upcoming crime show L.A. Noir (alongside another Walking Dead alum Jeffrey DeMunn) and Reedus shot a movie called Sunlight Jr. with Naomi Watts in between seasons two and three of the show. Next up, was something special. I watched a lot of television in my twenties, but nothing captured my imagine more than The X-Files. As I've mentioned before, I was obsessed with the show. Now, almost twenty years later, I finally had the opportunity to see Gillian Anderson in person. She took the stage looking absolutely radiant. I was clearly not the only one who thought so, as one of the first questions asked was how she managed to keep looking so fantastic. The emphasis of the questions were naturally skewed toward The X-Files, but did also talk about other work, such as House of Mirth, Great Expectations and a new project she just did with Michael Caine called Mr. Morgan's Last Love. When asked about her favourite episodes of the X-Files, she said that the one they had the most fun shooting was the “Bad Blood” episode, and the most fulfilling was “All Things” which Anderson herself wrote and directed. I think the most exciting bit of news for me though, was that she is currently working on a crime show for BBC Two called The Fall. If it's anything like Luther, I'm IN! 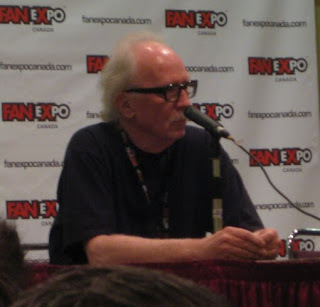 Last, but certainly not least, was the Festival of Fear's guest of honour John Carpenter. The Q&A was one of the shorter ones, but he was quite happy to answer questions until someone he referred to as his “drug dealer” whisked him away. I actually recorded this one, so here are some selected bits. If you'd like to listen to the entire Q&A, Rue Morgue just put up a link to the audio, which you can hear by going here. And that was about it. I wasn't able to see Rose McGowan, Tom Noonan or Chris Surandon due to conflicts, but I think I did pretty well considering. Check back tomorrow when I rundown the awesome panels I took in over the course of the weekend. Gillian Anderson photo courtesy of Torontoist.